My name is Amelia Hamrick, and I’m a junior music and fine arts double major at Oklahoma Christian University. I’m actually working towards a masters in library science, but I’d like to get into illustration, concept art and webcomics on the side! I’m still an art student but I hope to work on a professional level. I definitely draw a lot for fun outside of classwork though, so both! Fantasy and sci-fi mostly, though I dabble in other genres! Hmm… In no particular order, Hiromu Arakawa, Mike Mignola, Hayao Miyazaki, Maurice Noble, Bill Watterson, Roy Lichtenstein, Alphonse Mucha… There’s too many to list! I started out trying to color ink drawings in GIMP with a mouse! That never turned out very well, haha. I talked my parents into getting me a little wacom bamboo tablet for Christmas when I was in… 9th grade, I think? Layers, ctrl-Z, and transform tools, hahaha! I still do a lot of traditional work (I’ve really enjoyed working with gouache) but most of my not-schoolwork art is done digitally now. I used to go on occasional Google search sprees for all the latest drawing applications, and I found Krita during one of these about 3 or 4 years ago. My old computer couldn’t handle the windows build, though, and I hadn’t really gotten into Linux yet… I run ubuntuGNOME on my school-provided Macbook now, so I tried Krita again last year when it was just entering version 2.8, and I’ve used it ever since! When I tried it for the very first time on an old computer it looked really impressive, but it was just too much for that poor old box, haha. Krita’s performance has improved tremendously! It combines just about all the features of Photoshop that I’d use with a more streamlined interface, a MUCH better brush engine (loving the color blending and pressing E for erasing with any tool,) stroke smoothing and canvas mirroring like Paint Tool SAI… The feature I take most for granted, though, is the right-click preset palette! I guess I’ve already answered this, but it combines features from several different painting programs I’ve tried into one killer app! It’s the only program where I haven’t felt like I’m missing anything from my workflow. And being open-source is the cherry on top! This poster that I drew for a friend of a scene from her Pathfinder character’s backstory is the most ambitious project I’ve completed in Krita! 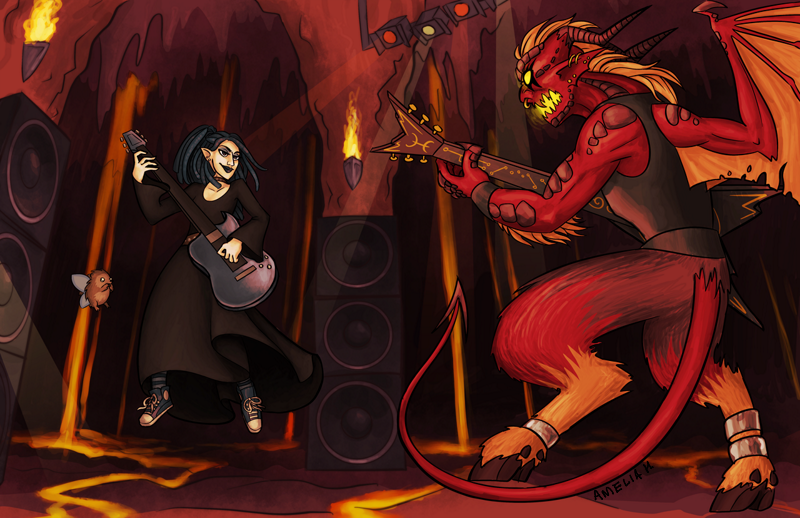 She won her magical flying-V guitar in a shredding duel with a punk rock demon… how can I pass that mental image up? I have an art blog on tumblr, and I’m working on getting a proper portfolio website set up! Thank you so much to everyone involved in developing Krita! I wish I could help code… maybe I can volunteer with updating the user manual! I’m also currently doing sketch commissions to help fund the Krita kickstarter!